EDIT-1: I had to leave a bit early, before the concert ended. 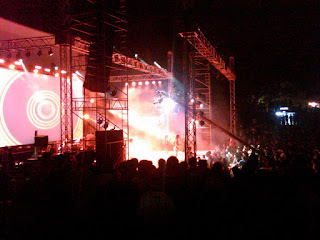 I hear from friends who were there for the entire concert, that the Chennai cops created a fiasco. Apparently; At around 22:30, in the middle of a song, the cops cut off the power, as it was crossing the curfew time. After some antagonism, the show was allowed to continue. Power was cut off abruptly before the last song ended. I heard this from a friend who was close to the stage. I am still digging on the internet for news on this. If this is true, it is real real sad.